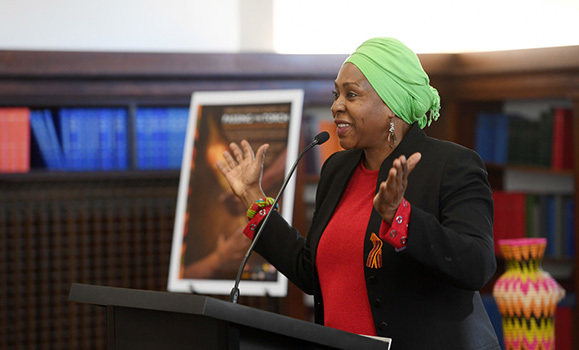 Members of the Dal community gathered Thursday to usher in African Heritage Month together. And though there were many significant individuals in the crowd — from former Lieutenant Governor Mayann Francis to Dal Professor and Canadian Senator Wanda Thomas Bernard — some of the biggest names were spoken of in absentia. They included James Robinson Johnston, Henry Sylvester-Wiliams, Marcus Garvey, Viola Desmond and Burnley "Rocky" Jones… historic figures whose efforts and achievements in the service of others speak to a legacy linking past and present. "You can see a trajectory . . . leading up to this day," said Afua Cooper, the James R. Johnston Chair in Black Canadian Studies. " I think the ancestors are proud, they are pleased, they are happy. And we will continue to do the work that is necessary to make diversity and inclusiveness a reality at Dalhousie." 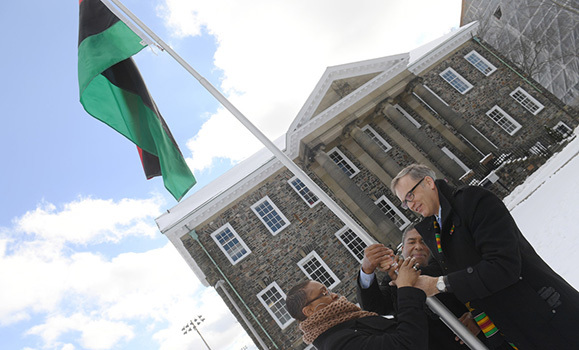 Thursday's event, organized in partnership with Dalhousie’s Black Faculty and Staff Caucus and held in the Macdonald Building’s University Hall, included speeches by Dr. Cooper and other Dal and community leaders, as well as the raising of the Pan-African Flag on the Studley Quad. Dr. Cooper called it an "historic occasion," noting this year marks the first time the tri-colour flag has been officially raised on Dal's campus and, perhaps, on any Canadian campus. Dal President Richard Florizone, who served as event MC, began his remarks by holding a moment of silence to honour the victims of Sunday's mosque shooting in Quebec City — all men of African descent. Following that, Dr. Florizone spoke of some of the many efforts over the years of individuals and groups at Dalhousie supporting African Nova Scotians and individuals of African descent, including the Imhotep’s Legacy Academy, the Black Student Advising Centre, the Black and African Diaspora Studies minor, the Black and Indigenous Mi’kmaq Initiative in Law — to mention just a few. But he also spoke of the need to come together as allies to do more in the future. "I'm personally committed to making more progress on our campus and I look forward to making this journey together with all of you." 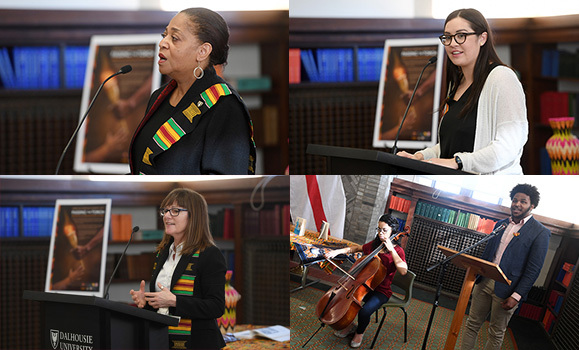 Other speakers at Thursday's event included Norma Williams, Dal's executive director of diversity and inclusiveness, who shared historical context behind the Pan-African Flag; Kathleen Reid, president of the Dal Student Union (DSU), who discussed the importance of allyship; Elder in Residence Geri Musqua-Leblanc, who opened proceedings with a prayer; and Dr. Katherine Harman, vice-chair of the Dal Senate, who delivered inspiring remarks on behalf of Kevin Hewitt, Senate chair, who was unable to attend. Fountain School of Performing Arts student Nathan Simmons also performed a rendition of "Lift Every Voice and Sing" at the launch event, accompanied by fellow Fountain student Maia Bruce on cello. 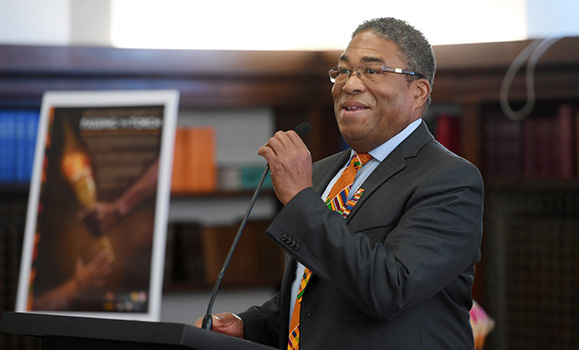 The Honourable Tony Ince, Nova Scotia’s minister of communities, culture and heritage, as well as African Nova Scotian Affairs, delivered one of the afternoon's most passionate speeches, focused on the provincial theme of this year’s African Heritage Month: “Passing the Torch.” He spoke of the men and women whose fights for justice and equality have lit the way for future generations. "The truth about carrying torches is they get very heavy after a long journey and our journey has been very long. We still have a long way to go," he said. "Today we have a torch that is burning brightly because of the hard work of the many people who came before us," he added — emphasizing that today's leaders and the leaders of tomorrow have a responsibility to keep that torch lit.